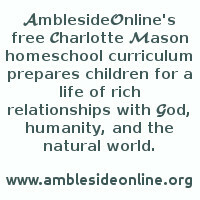 Year 0 is not a formal AmblesideOnline year like the other years for which we have booklists and schedules. Year 0 covers all the time from birth until formal school begins somewhere around age 6 or later. Year 0 does not have a booklist as such, and books do not have the prominent place in Year 0 that they have in other years. The book suggestions on this page are meant to provide examples of the type of books that would be consistent with the standards Charlotte Mason set. There is no need to find all of these books and read them according to a schedule. Simply use this list as a guide to selecting the best books from what you already own or have access to. There are many Picture Book lists to be found, but Charlotte Mason felt that children would be better with only a few wonderful picture books than a lot of merely entertaining ones. Coming up with a list of only a few books is very difficult because we all tend to love whatever we grew up with; it's human nature to find comfort in familiar, warm memories. We also tend to adore whatever brings our own children delight. It's so hard to separate such sentiment and emotion from objectivity and take a hard look at books from the perspective of what's really wonderful and beneficial for all children, and what we desire to share with others because of the special memories treasured by us rather than because the book itself is unusually great. What books stand above the rest? Charlotte said about education, "the answer cannot be given in the form of 'Do' this and that, but rather as an invitation to 'Consider' this and that; action follows when we have thought duly." In the same way, before we share our list, we would like to give some principles about how books should be chosen by parents wishing to embark on a Charlotte Mason journey with their children. Text should be literary to prepare children for the challenging books they'll be using for school, and cultivate a delight in beautiful names. Children should be discouraged from developing a taste for easy books that will undermine their capacity to read classics later. Books should be selected with the goal of decreasing dependence on pictures, and relying more on the imagination to envision pictures in the mind from the text. Illustrations should "have a refining, elevating effect upon our coarser nature" and bring us into the "world of beauty" while helping our children develop an affinity for, an attraction to, the beautiful, the lovely, the pure, the refining--because "education is concerned to teach him what pictures to delight in." Stories should have the noble, beautiful, inspiring kind of living ideas that CM espoused, including "the great human relationships, relationships of love and service, of authority and obedience, of reverence and pity and neighbourly kindness; relationships to kin and friend and neighbour, to 'cause' and country and kind, to the past and the present." Classic stories and poems illustrated by good children's artists (such as Gennady Spirin, Barbara Cooney, Edward Ardizonne, Ted Rand) are almost always a safe bet. Parents should also look at books used in Ambleside's years 1 and 2 when their children are ready for "chapter books." Now We Are Six ($). Accept no substitutes for the original stories! There are Kindle versions. In our opinion, they are overpriced, and not an adequate replacement for the book a child can take to bed and lovingly store under a pillow, or for the lovely Ernest Shepherd illustrations. Volume 1 includes: some Nursery Rhymes, some Aesop's Fables, myths, The Little House by Virginia Lee Burton, Play With Me by Marie Hall Ets, Goodnight Moon, A Hole is to Dig, Babar, some Robert Louis Stevenson poem from A Child's Garden of Verses, The Little Engine That Could, Curious George, Hillaire Beloc poems, The Story of Ferdinand, Pelle's New Suit by Elsa Beskow, A Kiss for Little Bear by Else Holmelund Minarik, Make Way for Ducklings, The Velveteen Rabbit, Alexander and the Terrible Horrible No Good Very Bad Day, The Three Bears, The Three Pigs, Whittington's cat, and some lesser known titles. Volume 2 includes Eugene Field's poem The Duel, The Owl and the Pussycat and The Pobble Who Has No Toes by Norman Lear, The Tale of Peter Rabbit, two poems by A.A. Milne, Grimm fairy tales, The Emperor's New Clothes, The Ugly Duckling, Ping, Where the Wild Things Are, Chicken Soup With Rice and individual chapters from Paddington Bear, Winnie the Pooh and Ramona the Pest. For the Children's Hour · by Carolyn S. Bailey "A choice collection of stories for the preschool child, carefully selected, adapted, and arranged by two veteran kindergarten teachers." Are you curious to have a look at which children's books are on the shelves of some of the Advisory and Auxiliary members that didn't make it to the "official" AO booklist? See a list of Advisory and Auxiliary favorites. Mister Rogers Neighborhood isn't on in most cities anymore, but you can watch 26 videos online at PBS's Mister Rogers webpage. There are a few more on PBS's video page, which has other PBS kids shows; you have to look for Mister Rogers in the box on the right. Ask a Question on our AO Forum!